Little Red Bike Cafe: Where did you come from today? We ask this question to our customers by way of a map. 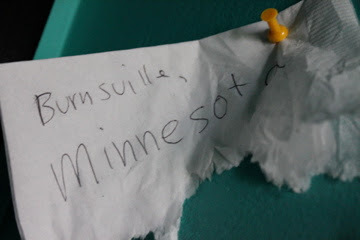 The question and map detailing inner Portland were posted on our cafe's bathroom wall, along with a collection of push pins, sometime shortly after we first opened our doors. In the beginning we were able to use the map as a tool, learning which North Portland neighborhoods made up the bulk of our customer base. To be perfectly honest, Ali was nervous about having such a thing on display, fearing that no one would ever come to the cafe, much less utilize the map, and that frankly that it would wind up being a physical footprint of failure we'd have to pass by every time we went for the mop bucket. Never in a million years did we imagine that our map would be where it is today. 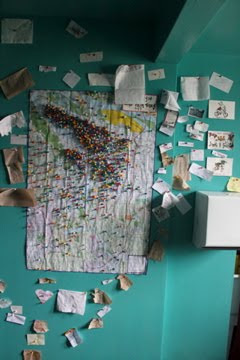 At some point along the journey cafe goers began "thinking outside the box," as well as the confines of the map itself. The wall has since taken on a life of its own. ...and California making up the vast majority of non-Oregon submissions. Even locations as far away as Okinawa, Japan have been recorded. Not fair really; given our time difference and the location of the international dateline, customers arriving to the cafe from Asia have a much larger window of time to visit the cafe "the same day" they arrived in Portland? Am I right, or has the caffeine ruined my brain? Let's just say we're very happy that people seem to enjoy answering the question, and that we're pleased as punch that people travel to get to us from near and far away. Sheesh, it really is pretty cool when you think about it. 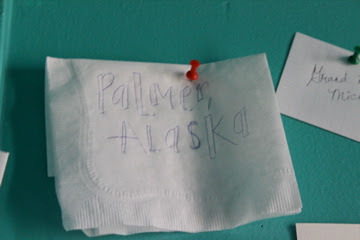 We visited the cafe in June and properly left our note to indicate that we hail from Crystal Lake, IL. 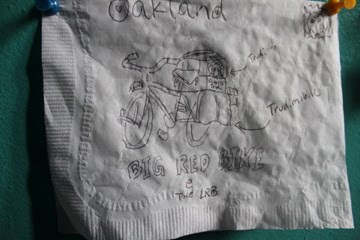 I've been reading your blog ever since our return home and sincerely wish you all kinds of success at the Little Red Bike Cafe. 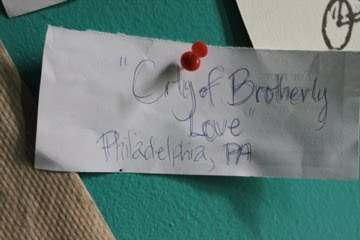 We loved the cafe and want you to be there the next time we visit Portland! it is a matter of fact that one can never have too many visitors from Tennessee. Thanks for making it happen for us! Thanks for writing...and reading the blog...and visiting the cafe. So glad you found the way to LRBC from Crystal Lake, IL. We look forward to your return! I visited the cafe in July but didn't use the bathroom. If I did, I'd have to put a sign up from Buffalo, NY!